Grout cleaning can be a nasty chore in Chicago, particularly if you live in an older home or apartment with original tile. While we like the nostalgia of keeping our Chicago homes original, with that comes the work of fixing up without tearing out. As a homeowner you have probably faced the challenge of keeping your tile grout clean. You have probably tried to keep up with store bought cleaning products and tough little scrubbers. You may even have a weekly cleaning service that has scrubbed your grout to a nub. Even with that routine you will find that your current methods really aren’t getting the greatest results. Sometimes, it feels like all that hard work is just a waste of time. It is really frustrating when you stand back and look at your hard scrubbing and realize that the product you have used to clean your tile and grout has actually caused damage. Some store bought products leave a white filmy, finish on tile. Even after rinsing it thoroughly it still remains and it almost impossible to polish off. Other products are so pungent they can actually leave one feeling lightheaded and little sick feeling. You may be one of those people whose has actually suffered with a headache after using a store bought tile and grout cleaner. All this adds up to fatigue, annoyance and frustration because your tile still looks dirty. It’s easy to see that the solution lies in calling someone to your rescue. Let’s face it; some jobs should be left to the professionals. 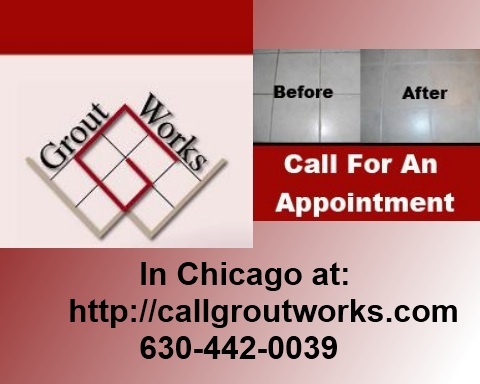 We approach grout cleaning in Chicago with the homeowners in mind. First we, do, a “tile inspection” before we start working. This way you can find out exactly how your tile can be improved upon. We don’t use high pressure water or steaming because while it may be popular, it is also destructive on grout and tile finished. We use a very mild cleaner that rinses clean and prepares our surface for the big finale. This will leave tile and grout looking completely renewed. We then use our proprietary grout color sealer. You can keep the same color as the grout you have or change it up to modernize any space. Future spills will not be able to penetrate the invisible barrier the seal has created. This means floors will stay cleaner, longer. Experienced technicians is the key to a successful grout cleaning and tile restoration project in Chicago. Since Grout Works has been in business since 1994, we have indepth training to make sure our technicians are experienced. Having the right equipment is important, but if a technician does not know how to use it properly, one will not get the best results possible. Also for peace of mind we offer a guarantee on our work. With this, you can be assured you will be happy with the outcome. We have references, so you can check with what previous clients are saying about the tile and grout cleaning and repair work they have had done. 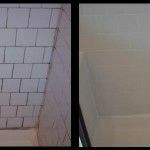 Whether you are just looking for grout cleaning in an old Chicago home or looking to clean up that newer home dirty grout, Grout Works offers the best product and service available in all of northern Illinois. So call us today for your no obligation free estimate for grout replacement, color and repair.